LOS ANGELES â Once the fists started flying late in the fourth quarter, LeBron Jamesâs home debut with the Los Angeles Lakers was relegated to the undercard. A wild multiple-player fight that included the normally mild-mannered Chris Paul and Brandon Ingram stole the spotlight shining on Jamesâs official landing on the West Coast. The Houston Rockets stole the rest with a gritty victory. James scored 24 points, but Paul, Ingram and Rajon Rondo all were ejected after trading blows late in the Rocketsâ 124-115 win Saturday night. But perhaps that energy â and a flagrant foul by Houstonâs James Ennis III against Josh Hart earlier in the fourth quarter â contributed to the fight that broke out with 4 minutes 13 seconds to play. Furious with the call, Ingram shoved Harden and then confronted the referee Jason Phillips after getting a technical foul. Rondoâs teammates said they didnât know whether Paulâs claim was accurate. Lakers Coach Luke Walton said his players were playing with extra aggravation after Ennis clotheslined Hart on a flagrant foul four and a half minutes earlier. âI felt like the other team was trying to provoke us, and we fell for it,â said the Lakersâ Lance Stephenson, another peacemaker in the brawl. Paul had 28 points, 10 assists and 7 rebounds before getting tossed. Clint Capela had 19 points and 12 rebounds, and Anthony scored 7 points off the bench as Houston rebounded from an embarrassing season-opening loss to New Orleans. Rondo had 13 points and 10 assists before getting thrown out. James also had five rebounds and five assists, but he went 1 for 8 in the fourth quarter, missing all three of his 3-point attempts. The fight could leave both teams without key rotation players because of suspension. N.B.A. 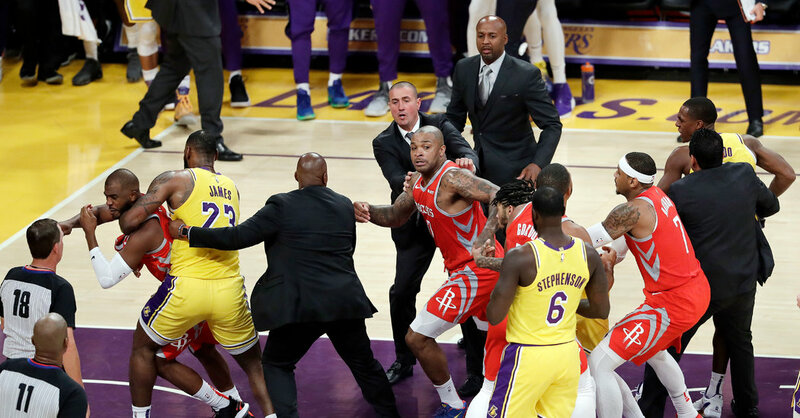 fights rarely get serious enough for the punches thrown by the principals, and the league discipline executive, Kiki VanDeWeghe, was in attendance.